A glimpse of the show last night. The singing was great and spirits were up. Today was the classroom party. There were a million sweet treats. We brought chocolate crinkle cookies and tangerines. Miss Barrett received one of the glittery stars we made last week. Sadie has had the hardest time parting with them. Every time I give one away she goes into this bit about she really, really wanted to keep the one I picked to give away. But I think Miss Barrett loved it. She seemed thankful to receive it. Anyway, the day was charged with sugar and sweets. I was baking all morning until the party at 1:30pm and Emma was whining her way into to one cookie or candy after another. She had yogurt with oatmeal and eggs and toast for breakfast. I think that was the only real food she ate. But you all know how the little thing can eat and looking back at it, the morning started out ok but it felt like all she had was junk. Anywho, there were cookies and jello, pudding treats and cupcakes, crackers and sparkling cider and then we had a sing-a-long. The kids requested the songs and Miss Barrett accompianed us with a trumbone and then the piano. She told us how the class went caroling around to each class in the school, with Miss Barrett on the trumbone. I laughed at the thought. 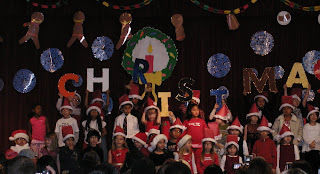 I know Sadie loves her class with all the music and singing they do on a daily basis. In fact, there has been a long list of instruments between the two girls for Christmas this year. I was shopping the other day at Lakeshore, a great store for toys and games that involve learning not just pink and princesses, and the sales associate asked if I was starting my own band. I replied that the girls already make enough noise with whatever they can find. I thought it was time they had the real stuff. After hanging out in the school yard with friends for a long time we headed back to rest up for our dinner and lights walk with Nikki and Neela. The three girls had lots of fun and were amazed at all the decor on Garrison St. It is so fun to be back in town and able to do little things like this with N&N. So here we go, three more days until Christmas.